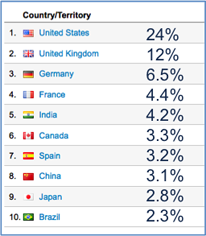 See the top 10 countries visiting the Jalview web site…. As World Cup excitement mounts, you can see several of the competing team's flags in our table showing the top 10 countries that visit our web site. We had our World Cup 2014 Sweepstake draw today for the Computational Biology Division, Team Jalview got Argentina and Ghana.